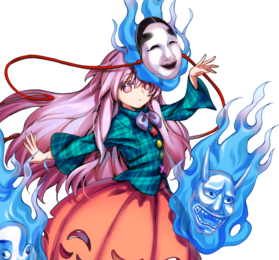 Hata no Kokoro (秦 こころ) is the main antagonist of Hopeless Masquerade and a menreiki youkai. She relies on her masks to show her emotions to others, as her actual face is emotionless and can be likened to a poker face. 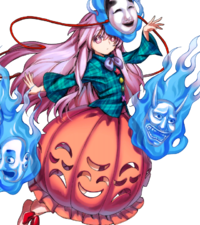 Kokoro first appeared as the Final Boss of Hopeless Masquerade, later appearing in Urban Legend in Limbo as a playable character. Kokoro naturally has a quiet, child-like personality but also a love of the stage, and relies on her masks to properly communicate her emotions. These emotions can be said to be stored inside the masks, as when she lost the Mask of Hope, her behavior became erratic. Before that, though, she is very quiet and hardly lets any emotion show. After the events of Hopeless Masquerade, she manages to stabilize her personality by developing a sense of self. Each of the masks which make up Kokoro embody powerful emotion, and will impress that emotion on the holder and those around them. When all 66 masks are together, their effects complement each other and are under Kokoro's full control. If an individual mask is separated from the group, it retains its properties, but Kokoro will lose the ability to feel that emotion completely. Losing her Mask of Hope caused Kokoro to become unstable and leech hope from her surroundings, until she was able to compensate by developing emotions separate from her masks'. Kokoro has a total of 66 masks, each depicting an individual emotion. During the events of Hopeless Masquerade, she is unable to express emotions without using these masks. Typically, she just uses the masks that represent joy, anger, pathos, and humor. These masks were created by Toyosatomimi no Miko, who later creates a replacement Mask of Hope modelled on her own face. Kokoro's original Mask of Hope is described by Koishi, who possesses it, as resembling a Jizo statue. 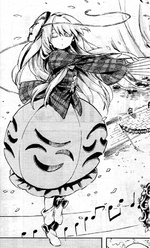 Kokoro briefly uses a number of substitute Masks of Hope as part of her attempts to stabilise her emotions, including festival masks (which are not very effective), and a mask specially crafted by Miko herself (which is too effective, and would cause her to stop existing as a youkai). Hata no Kokoro is a menreiki, a type of tsukumogami, born from 66 masks used by Hata no Kawakatsu in the sixth century. The masks themselves all became tsukumogami, and eventually coalesced into the youkai Kokoro, and appeared in Gensokyo at some point. Before the events of Hopeless Masquerade, she somehow lost her Mask of Hope. This caused the entire Human Village to start losing hope, and sparked the events that occur in the game. At first, she tried to balance the rest of the emotions of her masks, but losing just the one ended up driving her berserk. Hata no Kawakatsu is known as the father of Sarugaku theatre (a precursor to Noh), and is the centre of a legend which would connect him to Mononobe no Futo, Toyosatomimi no Miko, Myouren Temple, and perhaps even Moriya Shrine. In the legend, as told in Zeami's Fūshikaden, Kawakatsu was found in a jar as a baby on a river near Oomiwa Shrine during the reign of Emperor Kinmei. He grew up to be a genius, so the court made him a minister and given the surname Hata. When the country was in turmoil, Prince Shoutoku ordered Kawakatsu to perform 66 plays following Shinto and Buddhist traditions, and had 66 masks made for this purpose. These plays became the first Kagura, from which Sarugaku was later derived. After passing down the secret of his plays, Kawakatsu rode a boat and drifted out to the sea to uphold the tradition that non-human deities and Buddhas mustn't leave physical remains. He next came ashore in monstrous form, and haunted the surrounding area until he was enshrined by the local people as Great Rage Daimyoujin (大荒大明神, Taikou Daimyoujin), who was later regarded as an avatar of Bishamonten. Her full name is Hata no Kokoro, with Hata as the surname and Kokoro as the given name. Hata (the Japanese reading of Chinese surname Qin 秦) clan was an eminent Chinese immigrant clan mentioned in Nihon Shoki. It's also the surname of the masks' original user — Hata no Kawakatsu, who's said to be the reincarnation of First Emperor of Qin Dynasty in Zeami's Fuushika-den. Her given name is written entirely in hiragana and means 'Heart' (心, kokoro) in Japanese. 心 is also in the Japanese title of the game about her: Hopeless Masquerade (心綺楼, shinkirou). Kokoro has waist-length lavender hair, and blank eyes of the same colour. She wears a blue plaid blouse, adorned with buttons of various shapes (from top: red star, yellow circle, green triangle, and purple X). Her salmon-coloured skirt is pumpkin-shaped, and lined with holes in the shape of alternating smiling and frowning faces (both are the same pattern, flipped vertically). She always wears one of her 66 masks over some of her face. The story starts with Kokoro losing her mask of hope, causing the emotions embodied in her remaining masks to go berserk and begin draining the hope from the Human Village. This in turn leads the humans to latch onto religious leaders as sources of hope, as part of the "duelling fad". Reimu Hakurei and the others participate in the religious popularity contest and are eventually guided by Mamizou Futatsuiwa to the Human Village at night, where Kokoro searches in vain for her lost mask. Most of the characters who try to stop her come up with their own solutions to her hopelessness, including Byakuren Hijiri teaching her Buddhism to control her own emotions and Toyosatomimi no Miko making her a replacement mask of hope, but none of them completely work. Mamizou notices the contradictory actions Kokoro is taking and offers her own advice, which is to stop relying on the masks and discover her own, true emotions through meeting (and fighting) a variety of people. In the process of doing so she discovers her own anger at the religious leaders who are taking advantage of the situation, and Reimu, Byakuren, and Miko team up to stop her. Byakuren and Miko both claim that their solutions solved the problem, and Kokoro is invited to the Hakurei Shrine to perform Kagura as an offering to the gods. The story begins with Kokoro imitating the Kuchisake-onna and asking various people if she was pretty, with those people trying to repel her by saying the word pomade, but it doesn't work with Kokoro saying that she is the "new and improved Kuchisake-onna" and attacks them. Nitori, one of the people she encounters, reminds her that she is a mask youkai and it's later revealed that one of Kokoro's masks was cracked. Kokoro opts to get Miko to fix the mask, only for Mononobe no Futo to tell her that she was away at the shrine doing some important business. Futo then notices the occult balls that Kokoro possessed. She then wonders why Kokoro would be possessing occult balls as Miko was supposed to have collected them all. Futo then decides she'll take the balls from Kokoro and give them to Miko. After being defeated, Kokoro asks Futo is she was pretty before continuing her quest to find Miko. When Kokoro finally encounters her, Miko tells her that she was busy and cannot fix her mask at the moment. Miko notices the occult balls Kokoro had as well, and tries to defeat Kokoro for them, but fails. Kokoro then heads back to the human village to practice her Kuchisake-onna routine, and after finding out that the Kuchisake-onna attacks her victims regardless of whether they say she's pretty or not, decides to skip the question and attack right away. Afterwards, Sumireko Usami comes up to her and after Kokoro notices her foreign weapons and abilities, she feels the emotion of surprise for the first time in a while. Some time during the ending of her Hopeless Masquerade route, Kokoro performs Noh at the Hakurei Shrine in an attempt to stabilise her emotions, hiding her identity as a youkai. While popular at first, audiences are unable to understand her "play", which turns out to be based on illustrations from an old tengu parody. Noticing this, Mamizou approaches Kokoro and helps write Shinkirou, a modernised comedy based on the events of the religious war. While she was still alive, Miko created the 66 masks which Kokoro was born from. Miko later makes Kokoro a new mask of hope to replace her lost one. However, Kokoro discarded this mask, as its stabilising effect was so powerful that it would eventually cause her to turn back into a set of inanimate objects. Her feelings towards Miko over this are unknown. Mamizou keeps an eye on Kokoro during the events of Hopeless Masquerade and gives her some advice to help her develop her emotions. Afterwards she helps write Shinkirou for Kokoro to perform. Kokoro considers Koishi her arch-enemy, for finding her old Mask of Hope and refusing to return it. 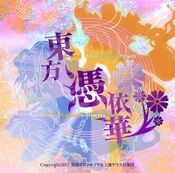 Cover of Hopeless Masquerade, featuring Kokoro's silhouette. 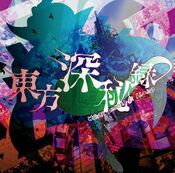 怒符「怒れる忌狼の面」 Angry Mask "Mask of an Angry Hated Wolf"
A silhouette of Kokoro occupies the front of Hopeless Masquerade's jewel case. Around and around, she changes emotions. In contrast to that personality, her actual face is emotionless. This is said to be the reason why she cannot maintain her self identity. After receiving this diagnosis, she set out on a journey to learn facial expressions of humans and youkai. Yes! Speaking of learning, it can only means that one thing! by the father of Sarugaku performance, Hata no Kawakatsu. Each mask depicts an emotion, and putting on a mask will change one's emotions. Those emotions influence those around the wearer, as well. She has a total of sixty-six masks. she normally only uses the masks for the four emotions of joy, anger, pathos, and humor. but the incident began with her "Mask of Hope" being lost. is what caused the sudden rioting. but losing just one mask caused her emotions' original powers to interfere with each other, and she went berserk. and aside from when her masks are required, she just quietly acts as a tsukumogami. Because of that, some say that when she goes berserk, she seems more human-like. As she uses her finishing move, she switches modes; she’s an emotionally unstable character whose projectile performance and such go through dramatic changes. Her Occult Attack, "Aesthetic Counter", is an all-purpose body-blow technique that grants 1 counter to the opponent when they’ve been attacked at least once per round. Once successful, it changes to a shooting attack that fires aura blades. I can't read this person's emotions at all." A menreiki who can manipulate any emotion. Her power to control emotions was linked to the incident in an unexpected way. Having been scouted out for this reason, she devotes herself to fighting in the possession battles. A technical character who can change her fighting style by changing her emotions. Those who master control of her emotions will master control of the battle. ↑ According to the in-game script, this is how it is represented. The "の" is actually a part of the furigana that make up the "秦" kanji. This page was last edited on 4 September 2018, at 15:09.